"And a heart is not a stone, It's fragile, fragile when alone"
I thought I'd quote Ben Harper the poet to start this post. I thought it pretty fitting to my mood recently while reading the book I told you about in my last post, "The Lost Memoirs of Jane Austen." Sorry to say, though, seems like a lonely heart also softens the brain. I don't really know why I bought this book. It was girly and pretty, and I figured "why not" is the reason I gave you before. I had not even reached page 10 when I realized it was a very bad idea indeed. I don't think Jane Austen would have been like that, though I don't know her and probably never will (though you never know, with the great progress of science...). I don't think it's aboslutely necessary to have been in love and have had you heart broken to write books like Jane Austen's. You can read them and understand them, and be moved by them, even when you've never fallen in love and your heart's never been broken, why should it be different for the writing of them? I don't like the starting point of that novel very much. Besides, I don't like "true stories" in general. I'm not a non-fiction kind of person. Really not. Apparently, pretend-non-fiction doesn't work too well on me either. Anyway. That'll teach me... Next time, I'll buy some Paul Auster. Have a nice day! ope it's as sunny where you are as here in Colmar! I have been reading books, as I said, and more particularly one book which my sister F gave to me, and which was really great. 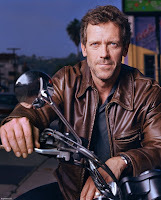 The reason why she gave it to me was that it was written by the famous Hugh Laurie, whom I have already mentioned on this blog a few times, because he is also known for playing the infamous Dr House. The one with the cane and the evil lines. The brilliant one who always figures it out in the end. Well, he wrote a book. Or rather, the actor wrote a book. It's areally cool book, and it's real fun to read. It's very interesting and keeps you riveted from beginning to end. And aslo it made me laugh out loud on the train. Which is nice and doesn't happen too often, but not so nice, because afterwards, people look at you as if you were a madwoman. I think I am know by train users in Alsace as "the madwoman who sneezes all the time". They must love me. Allergic to the train's air conditionning system, I guess... Anyway. Back to "the Gunseller". Yeah, cause that's the name of the book, "The Gunseller". It's really fun, as I said, and it's about a guy who gets dragged into some international terrorism plot. It's not goofy and annoying, because it's a book and not a comic book. It's serious at times, and the hero is real cool. And it's very entertaining. Now I've read it through, and bought a new book called "The Lost Memoirs of Jane Austen". Indeed. I shouldn't have. I bet it's going to be crappy. I'd better re-read Sense and Sensibility. But you never know. And besides, the cover is nice, there's a fake ribbon on it, and it appealed to my girly feelings. A nice change from international terrorism, I must say. But hell, you never know. I haven't even gotten started on it yet, so I'm going to give it a chance, I should not slander it even before I read a single page! Anyway. As I said, today, I want to talk about Sting's lyrics. I'm not generally a huge fan of his wo rk, though I really like what he does. I don't know, he's just a little too "I love the planet-ish" for my taste (says the big U2 fan, who still believes Bono has superpowers and is just about to save the planet by singing "One" in a beautiful duet with Bill Gates...) Sting's music's just some random stuffI like to listen to once in a while, if you see what I mean. But I was listening to it on the train yesterday (yeah, it's just some random stuff, but it's still on my MP3 player...) and I figured that his lyrics are really good. Once again, they are not particularly original ("the Russians love their children too..." that might well be true, but they still call them Boris and Vladimir, which sounds pretty cruel to me... Now I'm going to get death threats from Russians too...) but still, they are sometimes very good, poetic and well... it looks like I just ran out of adjectives. They sound a little like sayings really. Simple truths, things like that... "takes more than a licence for a gun"... And not just in "An Englishman in New York" which is obviously based on the concept. But still, "a gentleman will walk but never run" is my favourite example. I tried explaining that to my PE teacher for years on end. I walk, I'll walk for hours if you like, just don't make me run! It makes me look red and sweaty and I pant. It's not LADYLIKE!!! They would not listen. I don't know if you ever had to suffer the high school yearly race, reader. If you have, well, I propose we start some kind of club. "We survived the high school yearly race". We can trade secrets about how to fake an asthma crises or hypo-glycemia, immitate our mum's signature and stuff. I'm pretty sure it could come handy in our professionnal life too... "Can't come in! I'm sick. Look! My mum wrote a note!" Anyway. Where was I... Sting! Sting. 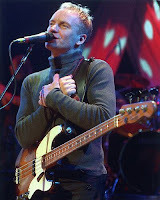 Well, I would have liked to move on to Fragile, and how it's very beautiful and wise, just like nearly all other Sting songs, but I'm afraid this post is not serious enough to adress such matters as a beautiful song, and I would hate to receive death threats from Sting fans as well. I'm in a silly mood so I'll not try to address poetry today... I guess I'll just leave it at that then! Have a nice day! 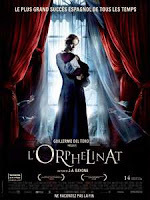 I like horror movies though, mainly because the stories (when there is one, which is not always the case) is often really sad, or good, or poetic, in El Orfanato's case, it was all three. Besides, it did not fall into the terrible trap of showing you a monster or gross things all along, because when people (directors mostly) do that to me, I quickly get used to it and lose interest in the whole movie. This time, there was only one really gross scene with an old lady getting hit by an ambulance (gross) but apart from that, it was mostly just terrifying. Especially one part where the nice lady gets attacked by a creature with a bag upon its head, which makes strange breathing noises, and which you can see coming from the other end of the corridor. Terrifying. But as I said, it was a very good terrifying movie, and if you have a chance of seing it, don't hesitate. Only beware. It doesn't make you sick, unlike Cloverfield, but it's pretty creepy, and if you're prone to nightmares, you'd better have a Disney DVD waiting at home!! I'd say Peter Pan would be suitable!